Topics: Fd Bio, Family Man, Builder, The Pro, Core Values, and Thumbs Up. 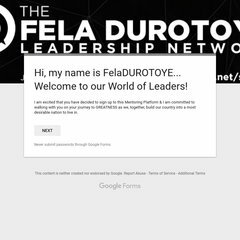 feladurotoye.org Fela Durotoye - MUSHIN MAKEOVER: HISTORY IS MADE! feladurotoye.org Fela Durotoye - Exam failure: Volunteer teachers could help turn ..
feladurotoye.org Fela Durotoye - Episode 3: Identifying business opportunities in .. The site has about 117 users daily, viewing on average 3.00 pages each. The site is programmed for PHP/5.2.9. It has 2 DNS records, ns1.hostnigeria.org, and ns2.hostnigeria.org. It is hosted by Fluid Hosting Llc (Pennsylvania, Audubon,) using Apache/2 web server. PING www. (208.87.24.11) 56(84) bytes of data.